Design your very own card or boardgame! 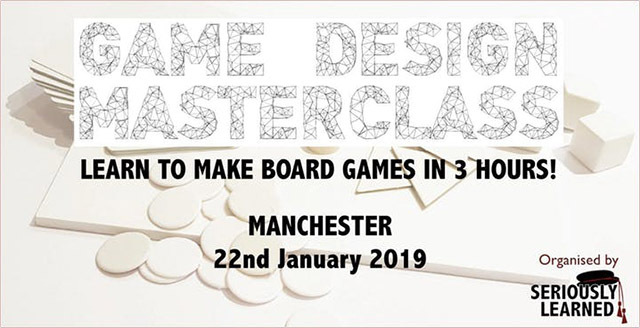 The Game Design Masterclass is a crash course in the theory and practice of creating exciting boardgames and card games. This event will be led by professional game-maker James Wallis, creator of Once Upon A Time, The Extraordinary Adventures Of Baron Munchausen and the new RPG Alas Vegas. The Masterclass itself runs for three hours: James will talk for about an hour, explaining how games work and how to make them, and then people work in small teams to concept, design, test, evaluate, rebuild and retest their games. Everyone gets to play two games created by other teams, and participants get to keep the games they’ve made. It’s fun, very popular, and previous teams have even gone on to set up companies to publish the games that they created in the Masterclass. This event is organised by Seriously Learned.